I don't know about you but for me this week has been tiring and exhausting! In a personal note I have been working hard at my new job and to meet some deadlines...okay, enough about work! Hopefully you can say that this weekend too and enjoy it. "For Mexicans, death is something good, not bad. We say death is like waking up, we are not afraid of death, we embrace it." 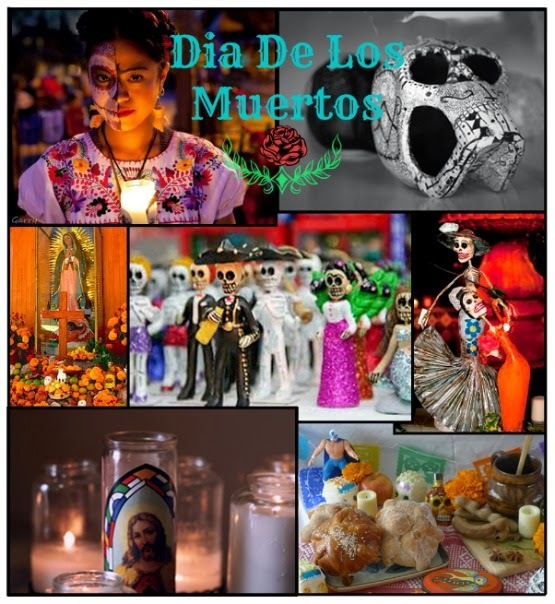 Yesterday (October 31st) was the beginning of "Dia de Los Muertos" (Day of the Dead) which takes place for three days of celebrating our loved ones who are no longer with us. This is a Mexican tradition that has been celebrated as far as the Aztecs era. During these celebrations it is meant to be happy celebration that you prepare your loved ones favorite food that is left at their alter or their grave site, sometimes it consist of bringing your entire family to the cemetery to clean their grave site. This celebration is meant to be happy with music and smiles. I am not Mexican but I do respect this holiday and reminds me so much of Peru's tradition..though we don't just do this for Halloween time it is something that whenever we get a chance to visit our family members we would bring flowers, clean their grave site and share stories of them. This weekend I will be thinking of my grandfather who I never met but always have in my heart.